When I think about the weekends that I used to spend at the office or behind the computer catching up, it makes me cringe. I did it to make the following week easier. I did it to make more money. I did it to prove what a hard worker I was. I did it because I felt guilty for falling behind and I did it because I had way too much to do. All legitimate reasons, but none of my catching up ever got me caught up. The illusion of catching up goes something like this: If I take a full day/weekend/week and abandon all the things I enjoy doing, I can get everything done that I feel guilty about not doing before. Then I will feel better, everyone will love me and all will be right with the world. And, everything will be complete. The reality is that catching up never ends. There will always be more. Email. The more you send, the more you receive. (otherwise known as vicious circle) Instead of saving it for later, or checking email on your phone 10 times a day, but never responding, do one solid email triage a day. Don’t respond to anything that doesn’t require a response. Be brief when responding to the email that does. If you have trouble with brevity, set a timer and challenge yourself to answer any email in 5 sentences or less. Sleep. Staying up late to catch up on things works against you. You can’t sleep an extra 3 hours on Saturday, to make up for the sleep you lost on Wednesday. If you routinely go to sleep and wake up at a similar time, you will be more alert, focused and effective. After a week of jet lag, I understand how sleep loss can affect your day-to-day activities. Sacrificing sleep and compromising other health habits to catch up will put you further behind when you don’t have the energy you need for your work and life. The news. If you haven’t read the paper or watched the news in days, you don’t need a CNN binge to catch up. There is rarely anything new about the news. All you can expect is more hype, stress and fear. (Breaking news is broken.) Recycle your old newspapers and magazines. Turn off the TV and go outside. You’ll learn more about yourself and the world there. Blog reading. If your blog reader is full and you have hundreds or thousands of posts waiting for your attention, start over. Declare blog reading bankruptcy and hit “clear all”. This might be a good time to assess what’s in your blog reader too. Did you add a paleo blog last year and now you are more interested in updates from a vegan blogger? Were you following a blogger that changed focus and lost your interest? It’s ok to remove blogs from your feed. There is more goodness to come. Make room for what means most to you right now. Social media. If you haven’t checked Twitter or Facebook in days, you are not obligated to read everything that was posted while you were gone. You didn’t miss a thing and chances are, whatever you missed will be repeated. Entertainment. You don’t need the latest TV, books, movies, games, music to be completely fulfilled. It will all be available if and when you are ready and if you are never ready, that’s ok too. Letting it go feels so much better than keeping up with it all. The reason you want to keep your hands in everything and be completely up to date is F.O.M.O. (fear of missing out) You want to read every email, blog post, tweet, and Facebook update so you don’t miss anything. Maybe F.O.M.O. is why you watch the news, catch up on gossip and have TV marathons. The problem with F.O.M.O. is that the more you know, have, do … the more you know, have, do. Then, it’s not enough to see all the tweets and Facebook updates, but you have to click on all the links and watch all the YouTube videos and then comment or respond so everyone knows you are all caught up. After catching up on Facebook, you might notice that you are way behind on everything else. Stop. You won’t miss a thing and you will enjoy what you know, have, and do even more. All of these strategies may help you curb the catching up, but none of it will matter if you don’t recognize why you have to spend so much time catching up and why you always feel like you are falling behind. The answer is simple. It’s too much. The remedy? Less. Own less. Do less. The road from too much to much less is not always easy, but necessary for your health, relationships and happiness. If you don’t have time keep up, you definitely don’t have time to catch up. Instead, let go and start fresh. That might mean declaring email or blog reader bankruptcy, being wildly uninformed for a while, addressing your fear of missing out, and will most certainly mean letting go. Above all, by ending the game of catching up, you may discover that you already have everything you need. 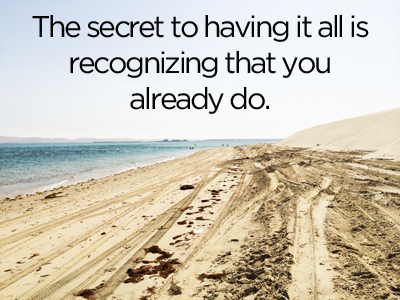 The secret to having it all is recognizing that you already do. xoxo – glad it resonated with you Kathy! The Blog Reading paragraph was me last week! I deleted everything, and then took a well-spent hour deleting anything where I couldn’t remember why I followed in the first place. Now I check my reader a max of 2x a day and if I don’t check it for a few days, I come back to a few posts by people I love to read. There are so many awesome blogs out there, but when we read too many, the impact is diluted. Instead of being inspired to action, we are overwhelmed with ideas. I’m visiting my reader once a week now and it’s enough. Way to go Melissa! I really like this post Courtney. I just started reading Overwhelmed: Work, Love and Play When No One has the Time and a simple lifestyle keeps rolling around in my head. There wouldn’t be as many issues with time if people would include more “less” in their lives. Thanks Lauren, I’m really looking forward to reading Overwhelmed. Sounds like great inspiration to do less. Ironic. You just added something to your “to do” list. I love the idea of “starting fresh” and “being wildly uninformed for a while.” I’ve done that myself a few times, and I highly recommend it. Great post! I also found myself doing this with our DVR. If I have 3-4 unwatched episodes of a show, that probably means I’m not really excited about it and it’s not worth my time so I stop recording it. I can always netflix it later if I change my mind. Great post. “If you don’t have time keep up, you definitely don’t have time to catch up.” So true. That was my favorite line , too. This is right on Courtney! Practical and insightful as always. It’s so true, “Sacrificing sleep and compromising other health habits to catch up will put you further behind when you don’t have the energy you need for your work and life.” Sleep, rest, slow down…at the end of the day, there is always something we’ll leave undone anyways. Great post! Thanks. With new twins Kelvin, I’m thinking you could use a great night of sleep! As someone who just spent half of last weekend clearing out my inbox from work, this article really spoke to me. I’ve been embracing minimalism and am currently reducing the number of digital feeds, apps, etc. that I’m subscribed and exposed to. It really does help to step away from the fire hose. Yes, this spoke to me as well. I’ve been ignoring my Facebook, because I’m new to blogging and find it’s taking lots of my time. I definitely have FOMO but now based on this I have more confidence to declare a blog and email reader bankruptcy anytime I need it! Thanks Courtney! This is in my top-tier favorite posts by you. Thanks for thinking these thoughts and doing the work of typing them out and sharing them with us. I love this post for my home life and often do just what you suggest. But, Please!!!!! How do we do this with our work life? I teach High School Sciences and just can’t keep my head above water. I feel so guilty, when I don’t get all the papers graded in a timely matter, or plan better lessons because I ran out of time. I finally stopped bringing things home and it does make my home life better but It just makes 8-4:30 worse. How do we simplify our jobs without changing careers? As one who actually did leave teaching (middle school) because of the head-above-water syndrome you describe, I’m totally unqualified to commandeer some else’s blog. That being said, I’ve spent some time thinking about this and feel compelled to answer anyway. –Recognize and celebrate your successes. Teaching can be a very demanding profession. A great deal of work is expected of you from students, administrators, and state standards. Therefore, it’s easy to see the things that don’t go quite right. Take some time to find the things that went well and give yourself a pat on the back for them. (Be Present). I hope this helps…and that Courtney forgives me for this egregious hostile takeover. I love this post. And I absolutely, positively agree with you! The attempt to ‘catch up’ on many things continues forever. I’ve embarked on the ‘less’ route for about a year now, and it has made such a difference! Delete is a button that is so under used. But i on the other hand use it with reckless abandon. Delete, delete, delete. I love this post! Matthew, I too am of the “left teaching because I was drowning” set, so I understand completely. What I have found in my Encore Voyage is that much of what we attend to is important because it is what OTHER people think we should pay attention to. Facebook, Twitter, and yes, even blogs. When we simplify life and stop trying to play “catch-up”, the resulting freedom of thought is so liberating! Instead of chasing down what other people want me to see, I now spend my time exploring my own curiosities! Great advice! Stop and smell the roses. Great post, Courtney! I always have to remind myself that everything I need will still be there tomorrow, and that I really should get some sleep. Like, now in fact. I am commenting on your post, when I should have probably been in bed hours ago. Tomorrow is another day! I just scanned the article and thought “I want to read this later” as I hit the Read Later button on my iPad. The irony hit like a ton of bricks. I’m going to say “FOMO!” out loud when I catch myself in the cycle of checking, reading, etc. FOMO! and step away. Thank you. Oh, this is great! I think on this constantly – the to do list I’ve been working to get to the bottom of for years has never gone away and it never will. I have major FOMO and that is my biggest obstacle – tackling that is a major life simplifer! Thank you for the post and giving me plenty to think on! I spend so much time focused on trying to keep up with myriad TV shows and I’ve actually been thinking about stopping watching some, but maybe I’ll go cold turkey and really focus on the other things I want to do….thanks for the post! YESSSSSSS!!!!! I zapped all social media aps from my phone this week as part of an experiment in mindfulness. I do not think they will be going back on, and in fact, next week I will be off social media entirely as part of the Reading Deprivation exercise from The Artist’s Way. I cannot tell you how much more focused and peaceful my days have been because I have not been an addled crack monkey checking Facebook every time I have a spare 30 seconds. Instead I relax, let my mind wander, chat with someone in line at the grocery store, observe my children interacting with the world… Then, checking in from my laptop later in the day I am overwhelmed, not just by the size of my FB feed, but my the sheer amount of crap on it that, rather than illuminating and bettering my life, just makes me feel oppressed by all the things I “must” watch/see/read. I still like FB to keep up with my friends and family, but some drastic pruning is in order. Love the idea of email bankruptcy…going to take the leap of faith!